This parsley and garlic-rubbed oven baked salmon recipe is sure to become your new favorite… Makes a main dish + 2 sides with just one pan to clean up! This is a sponsored conversation on behalf of Alaska Seafood as part of an Influencer Activation for Influence Central; all opinions and text are my own. Thank you for supporting the brands that support this site! Maybe you caught my grilled salmon in foil post back in June? If not, I’ll give you a quick recap. Cooking fresh fish has long been out of my comfort zone. In an effort to remedy this, I decided to try creating a simple salmon recipe. I figured on a lukewarm response from my family, but it turned out that they loved it and wanted more, more, MORE! PIN IT NOW, MAKE IT LATER! CLICK HERE TO PIN THIS RECIPE. First things first… When it comes to salmon, I’ve learned to look for wild-caught Alaska salmon at the grocery store. It’s in season right now, which means it’s uber fresh. Plus, wild-caught salmon is higher in omega-3s, lower in fat, and contains less toxins than farmed fish. So I #AskForAlaska! Tip: you may or may not need to remove the pin bones from your salmon fillet. Read up on how to do it here! The key to this tasty one pan salmon and asparagus recipe is in the simple parsley and garlic rub. 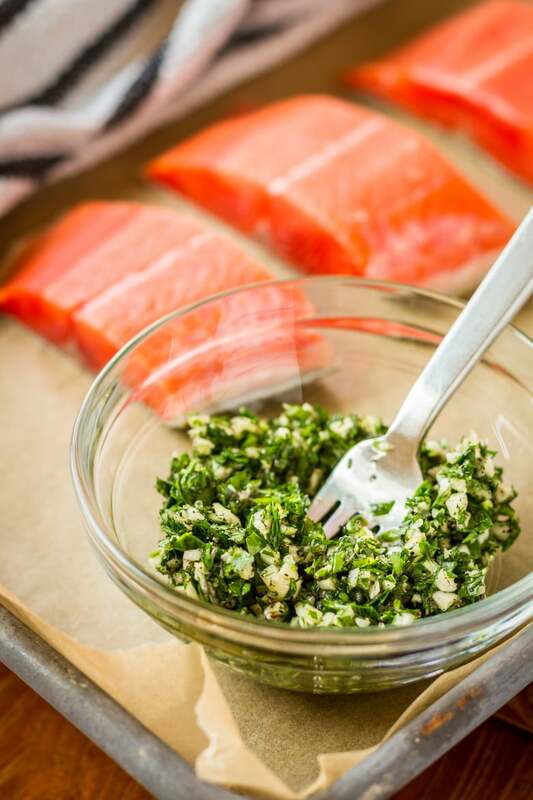 Mix together chopped fresh parsley, minced garlic, melted butter or ghee, salt, and pepper, and slather it all over the cut side of the salmon fillets. Let them sit for about five minutes, and then they’re ready to bake! I surrounded my salmon fillets with fresh thin asparagus and parboiled baby potatoes. Since the salmon is the real star of the show, I kept them very simple with just a drizzle of olive oil, plus some salt and pepper. Bake for 16-18 minutes, and dinner is served! I like to garnish this dish with a little extra chopped parsley sprinkled over the potatoes and a squeeze of lemon all over. Dress up the salmon even more with a few thinly sliced lemon wedges. PIN IT NOW! 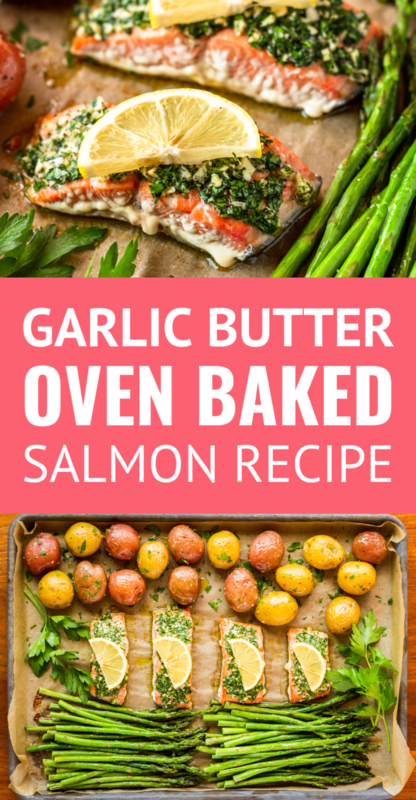 CLICK HERE TO ADD THIS OVEN BAKED SALMON RECIPE TO YOUR EASY RECIPES BOARD ON PINTEREST! 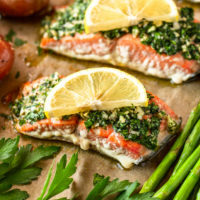 This parsley and garlic-rubbed oven baked salmon recipe is sure to become your new favorite... Makes a main dish + 2 sides with just one pan to clean up! Preheat the oven to 400 degrees. Line a baking sheet with parchment paper. While the oven is preheating, place the potatoes in a pot and fill with water so that it just covers them. Bring to a boil and cook for 12 minutes, until parboiled. Drain well. In a small bowl, stir parsley, garlic, melted butter or ghee, salt, and pepper together with a fork. Press the rub mixture firmly into the cut side of each salmon filet. Let the salmon rest for about 5 minutes before cooking. 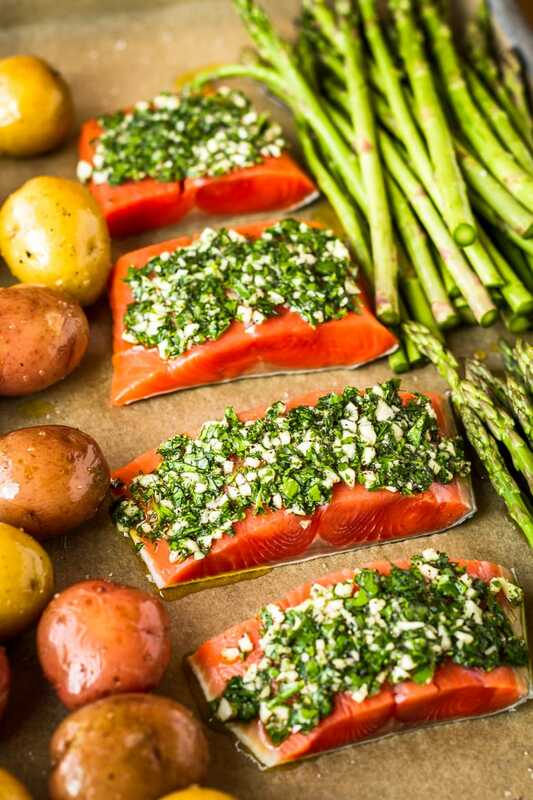 Place the salmon, parboiled potatoes, and asparagus on the baking sheet. Drizzle the potatoes and asparagus with about 1 tablespoon of olive oil each. Then sprinkle with kosher salt and pepper to taste. Place the sheet pan in the oven and bake for about 16-18 minutes, until the salmon flakes easily with a fork. Garnish with additional parsley and lemon as desired, and serve immediately. *Use melted ghee to make this recipe Whole30-compliant! Looking to add more salmon recipes to your menu? Here are a couple more equally delicious and easy options! I’d love to see how your oven baked salmon and asparagus turns out… Tag me @Unsophisticook on Instagram or use the hashtag #Unsophisticook so I can check it out. Enjoy! My fiance requested salmon tonight and I had no idea what I was going to do with it until now! I’m going to take a little short cut and use a pesto pasta that I have I need to get rid of, but now I’m looking forward to dinner – thanks for a simple, yet tasty idea!! I am loving everything about this, such a simple and easy dinner! 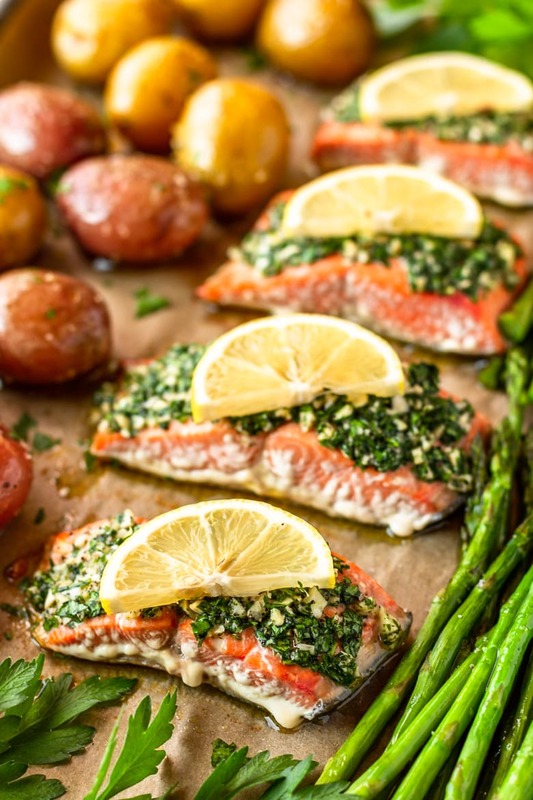 This sheet pan salmon looks wonderful. I love all the ingredients, baby new potatoes, fresh asparagus and salmon! We are just starting asparagus season here in Northern Italy, so am going to make this as soon as I get some asparagus! I just bought some salmon I was going to make for dinner tonight so this will be perfect, love how simple the ingredients are! I am a lover of fish and this one looks perfect and delicious. Have to make it for my family. 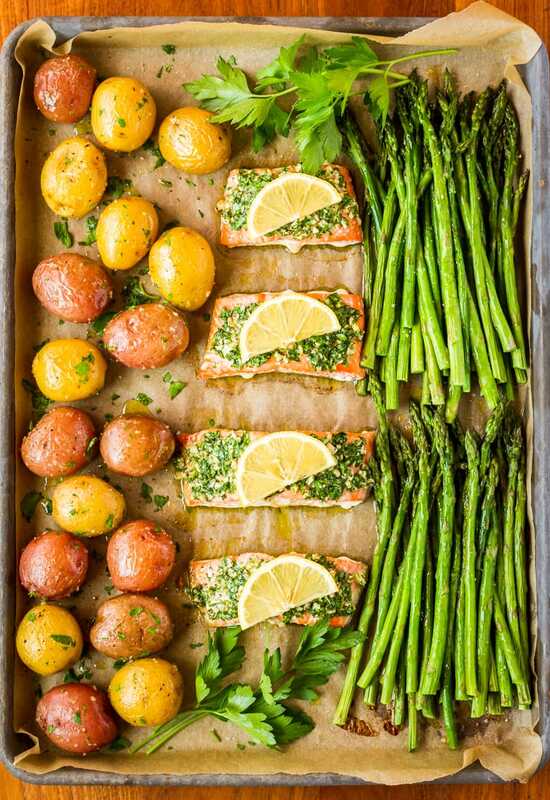 Healthy, flavorful, and all on one sheet pan? This is my kind of meal! This was so flavorful! Will definitely make it again. This is my kind of recipe! Salmon is the number one favorite fish in our family and it’s usually on the table once a week. We like to grill out but, if the weather is bad, cooking it on a sheet pan would be ideal. I love how it’s so easy to prepare and so easy to cleanup. And it sounds super delicious! This looks so delicious. When I have free time, I’ll make it for my familly. Thanks for recipes.